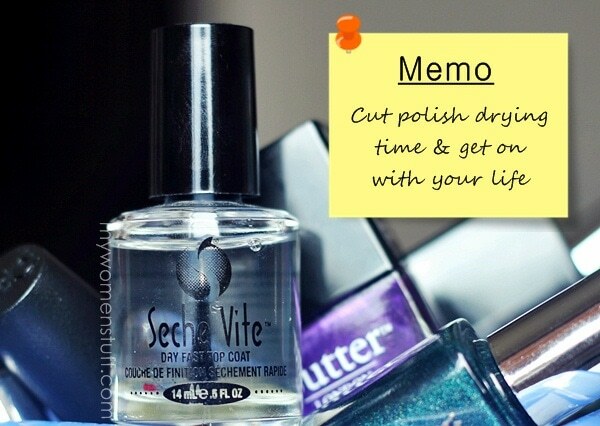 Home » Makeup » You need Seche Vite Dry Fast Top Coat in your life! What is your favourite nail polish top coat? Granted, the Seche Vite Dry Fast Top Coat doesn’t exactly dry the nail polish in full, but it leaves it dry to the touch, so you can actually function as a normal human being without having to have your hands sticking out of you as you wave your freshly painted nails under the fan. 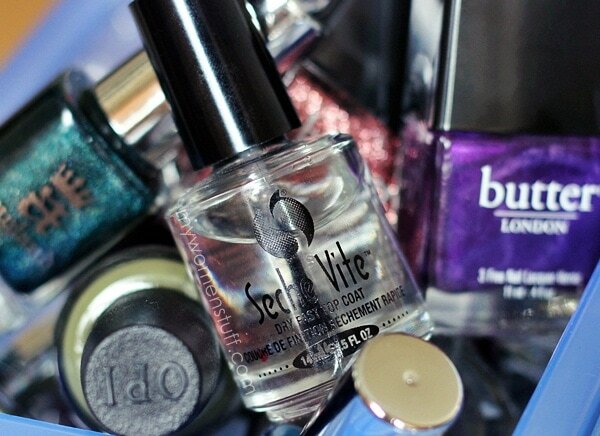 I usually apply a layer of Seche Vite over the last layer of colour and it helps to not only seal the colour and protect from chips and wear, but also helps to even out the nail colour. This last point is especially helpful if you are anything like me and a right klutz at painting your nails. Sometimes, the colour is a bit streaky, so I apply a layer of Seche Vite top coat over the polish while its still a little wet and it helps smoothen the colour. I’ve read of complaints that Seche Vite can cause the colour to “shrink” away from the nail tip so some people experience wear faster. I’ve never had that. With this top coat on, I can take my nail colours for about a week without wear showing significantly. The shine does start to wear off after a few days, but in the main, I have little problems with this top coat. I also remove colours after about 2-3 days because I get bored so longevity doesn’t bother me. The primary boon is of course the quick drying aspect. In about a minute, if you just touch the surface, the top coat would be dry and you can go on your merry way. I paint my nails before bed most of the time, so this is very very important for me. If you press down hard on it you will of course expect to see an imprint because its not quite dry all the way through, just on the surface. Another problem I’ve read about is the Seche Vite top coat thickening up quite quickly. There is a product to restore it called Seche Vite Restore that you can add to the bottle to restore the consistency. But I’ve had my bottle for a few months now, and I haven’t experienced this thickening problem yet (touch wood!). I maybe in the minority, or I just may be oblivious (I suspect the latter) but so long as I don’t have a problem with the product I’ll hold out on getting the Restore. PREVIOUS POST: Your Say: Do You Pack Your Favourite Makeup When You Travel? Oh yay, welcome to the Seche Vite club, Paris! I bought a bottle last summer, and I’ve never been so happy with a top coat in my life! In my experience it doesn’t shrink or drag color off my nails, and the fast-drying part is really no joke! I used to use the OPI top coat, but I often painted my nails before going to bed, only to wake up and find I’ve managed to dent my manicure in my sleep… With Seche Vite that’s just not a possibility anymore! Yes, Seche Vite is the only top coat I use now- it dries SO fast and is nice & shiny! Haven’t had any problem with shrinkage. My nail salon uses OPI top coat, which I find does not dry quickly at all. I bring my own Seche Vite now, after denting my nails twice with the OPI top coat.